British Australasian colony. 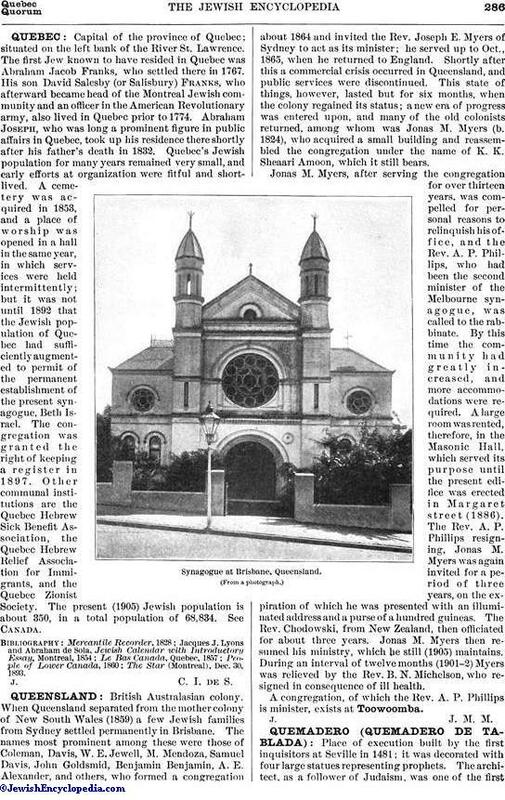 When Queensland separated from the mother colony of New South Wales (1859) a few Jewish families from Sydney settled permanently in Brisbane. The names most prominent among these were those of Coleman, Davis, W. E. Jewell, M. Mendoza, Samuel Davis, John Goldsmid, Benjamin, Benjamin, A. E. Alexander, and others, who formed a congregation about 1864 and invited the Rev. Joseph E. Myers of Sydney to act as its minister; he served up to Oct., 1865, when he returned to England. Shortly after this a commercial crisis occurred in Queensland, and public services were discontinued. This state of things, however, lasted but for six months, when the colony regained its status; a new era of progress was entered upon, and many of the old colonists returned, among whom was Jonas M. Myers (b. 1824), who acquired a small building and reassembled the congregation under the name of K. K. Sheaari Amoon, which it still bears. Jonas M. Myers, after serving the congregation for over thirteen years, was compelled for personal reasons to relinquish his office, and the Rev. 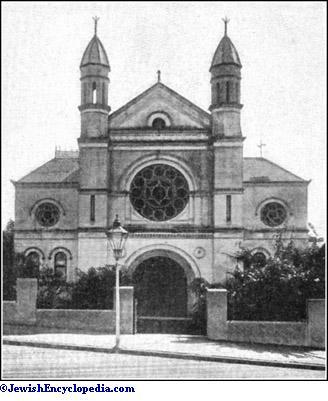 A. P. Phillips, who had been the second minister of the Melbourne synagogue, was called to the rabbinate. By this time the community had greatly increased, and more accommodations were required. A large room was rented, therefore, in the Masonic Hall, which served its purpose until the present edifice was erected in Margaret street (1886). The Rev. A. P. Phillips resigning, Jonas M. Myers was again invited for a period of three years, on the expiration of which he was presented with an illuminated address and a purse of a hundred guineas. The Rev. Chodowski, from New Zealand, then officiated for about three years. Jonas M. Myers then resumed his ministry, which he still (1905) maintains. During an interval of twelve months (1901-2) Myers was relieved by the Rev. B. N. Michelson, who resigned in consequence of ill health. A congregation, of which the Rev. A. P. Phillips is minister, exists at Toowoomba.